Your big picture strategy for bigger things to come. At this point in law school, you should have a study strategy that helps you move successfully toward becoming a licensed attorney. You’re busier than ever with classes, clinics, job interviews and extracurricular activities. While you work to build your resume and cultivate career leads, maximizing your time wisely is as important as ever. There’s no need to cut corners. 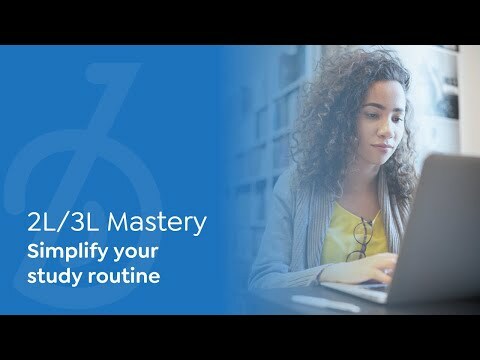 Whether you want to maintain your GPA or press harder to improve your class rank, our new 2L/3L Mastery study aids will help you succeed. Unlock online access now: Enroll in BARBRI Bar Review and make a $295 payment. Once you have enrolled in BARBRI Bar Review and made your $295 payment, all you need to do is SIGN IN to your BARBRI Bar Review account to access. Watch BARBRI online, on-demand video lectures to review complete subjects in just a few hours. The on-demand video lectures are presented in sections so you can easily find and watch the specific topics of interest. You can preview the topics to be discussed in an upcoming class or review the entire subject in preparation for your final exams. Watch lectures at twice the normal speed. Bookmark your place at any time in order to come back later right where you left off. With a single click, instantly go back to replay the last 30 seconds. The nation’s top law school professors explain key principles for each subject in a way that is captivating and memorable. BARBRI is widely regarded as having the definitive “who’s who” of law professors, practicing attorneys and legal minds delivering our lectures. They are well established and well respected. They’re well versed in the nuances of specific areas of law. They’ve been doing it for a long time – in some cases, as many as 40-plus years. They know how to focus your review on the most pertinent topics, concepts and issues and, most importantly, they know what law professors like to test and how they like to test it. PRACTICE QUESTIONS: DIVE INTO UNDERSTANDING "WHY"
Working practice questions as you go will help you cultivate a better, deeper understanding of the law and its application. The practice questions track back to specific sections of the video lectures. Bring it all together for the most effective learning and retention: watch the lecture, outline your notes (take a little break), and then work the practice questions. Rather than relying on rote memorization, you are building the skills to think critically through issues and to correctly apply the black letter law. Enroll in BARBRI Bar Review today, make your payment and get started right away. If you already have a BARBRI Bar Review account, SIGN IN to access.